Across all art, and indeed all human emotion, violence and beauty have performed an ongoing, carnal dance that makes them inextricably linked. This visceral communion is brought to life superbly by artist Cristina Planas and her piece The Fissure, which uses her own body alongside vintage slides of bullfighting to investigate the slippery relationship between dominator and dominated, slayer and slain. 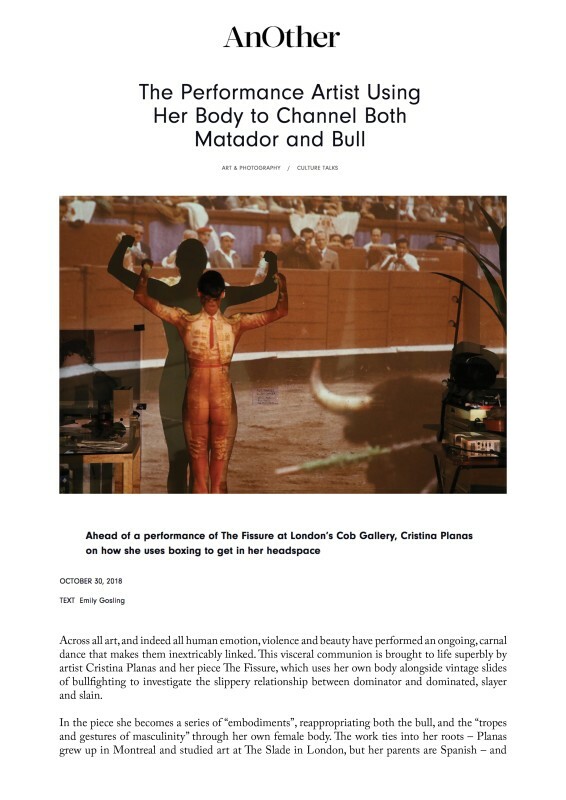 In the piece she becomes a series of "embodiments", reappropriating both the bull, and the "tropes and gestures of masculinity" through her own female body. The work ties into her roots - Planas grew up in Montreal and studied art at The Slade in London, but her parents are Spanish - and a chance meeting with a girl who was selling a slide projector, and happened to have a number of 1970s bullfighting slides. "There's always an element of narrative and storytelling in my work, sometimes it's hard to tease out how much of the story needs to be told and how much can be experienced," she says. "A lot of it is relational, about the structures of desire, conflict and emotional duality." She adds: "I perform mostly naked as it's about the vulnerability of the body. But I don't feel naked when the image is on me."